, religious practitioner in various, generally small-scale societies who is believed to be able to diagnose, cure, and sometimes cause illness because of a special relationship with, or control over, spirits. ..... Click the link for more information. ). Exorcism may be applied to a particular person or thing or may be used in a more general way. In central Europe during Walburga's night (or Walpurgishnacht, May 1), the traditional witches' sabbath, witches and demons are exorcised from the town by use of holy water, incense, and loud noises of all kinds. The scriptural justification for exorcism is found throughout the New Testament, and many instances of Jesus' ability to cast out devils are recorded. 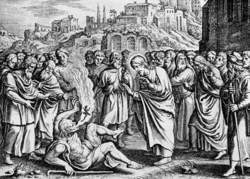 Seventeenth-century engraving of Jesus healing the possessed, by Matthaus Merian. Fortean Picture Library. Whenever a religion embraces a component involving evil, personal, spiritual entities, the possibility inevitably arises that those entities may inhabit human beings. Demons or devils, it seems, are never really happy until they have a material body in this dimension in which to carry out their diabolical plans. The problem then becomes one of casting them out of their human host. Enter the exorcist, whose job it is to free the innocent victim of spiritual entities. The motion picture industry has really had fun with exorcists. Beginning with the serious Rosemary's Baby and continuing through the light-hearted Ghostbusters and beyond, exorcism sells. There is even an exorcist on a Christian cable television network whose half-hour infomercial assures you that, for a fee, he will send you an instructional book and video and personally pray with you if you attend one of his religious services in which demons are driven out while the studio audience looks on. It costs a few thousand dollars, but there are payment plans available. If you can't afford that much, there is a cheaper plan that only costs about one thousand dollars. You get the book and video, and he will pray with you over the telephone. If that's still too much, you can get the book and video for sixty dollars or so. When television evangelist Jimmy Swaggart was going through his trouble, facing allegations of soliciting prostitutes, his peer Oral Roberts swore he could see demons all over the poor evangelist. He prayed for him, and Swaggart came clean in his famous televised apology. In an Associated Press report dated February 19, 2002, a Vatican spokesman neither confirmed nor denied a report that Pope John Paul II has carried out three exorcisms during his papacy, the latest in September of that year. The Reverend Gabriele Amorth is an official exorcist for the Rome diocese. He did confirm that a young woman who appeared to be possessed was freed during one of the pope's general audiences. Cardinal Jacques Martin, a former papal aid, wrote in his memoirs about an exorcism performed by John Paul on an Italian woman in 1982. The AP report went on to say: "In 1999, the Vatican issued guidelines for driving out devils, stressing the power of evil. John Paul has repeatedly sought to convince the skeptical that the devil is very much in the world... and he wanted to give an example to his priests." The Catholic Church has long practiced the ministry of exorcism, stressing the importance of remaining in accord with canon law. The whole process is outlined in the Rituale Romanum. The diagnosis of possession must be confirmed by the Ordinary of the Diocese, and the exorcist engaged is set apart for that ministry. 4:33) and promised that his followers would, too (Luke 9:1). So it follows, say those in the charismatic movement, that he meant for all those who were filled with the spirit to minister in this way. But when people start indiscriminately to confront devils without benefit of clergy, all hell can break loose. So church officials recommend going through all the proper ecclesiastical channels. Outside exorcism, few phenomena so vividly demonstrate the gap that exists between traditional religious believers and those attempting to express their faith in a modern context that assumes the validity of contemporary scientific worldviews. Religious beliefs in most traditions assume the existence of a variety of invisible entities—some good, others bad—that freely interact with humans in a variety of ways. As science and technology—especially the modern disciplines of the psychological sciences—have emerged, the idea of spirits or demons as an active part of human life has been all but abandoned. The idea of demon obsession/possession has been explained away in terms of different psychological disorders. In spite of the dominance of psychological perspectives in the contemporary West, the belief that demons can afflict individuals and that exorcism can be used to drive away the demons and restore the person to normalcy continues to operate in some churches. The Deliverance movement in Pentecostalism is centered upon the effort to define demon activity today and to assist people in overcoming demonic influence in their lives. Belief in demon possession and the emergence of exorcists as specialists in healing the possessed is documented liberally in ancient texts from around the world and probably predates writing. Jesus frequently exorcized individuals, and his apostles and followers continued that practice. As the hierarchy of the church developed over the first centuries of the Common Era, the office of exorcist was designated within the priestly orders and exorcism institutionalized as part of the process of joining the church. Thus, new Christians (including the church being confirmed) went through a rite in which God was asked to break the power of Satan in the individual’s life and expel any demonic influence. To the present, all priests in the Roman Catholic Church are ordained as exorcists as they pass through the minor orders, and in both the Roman Catholic and Anglican churches, confirmation still includes a ritualized exorcism. Most Protestant churches abandoned the practice after accepting the arguments put forth by theologian Martin Bucer (1491–1551) that exorcism of new believers was not a biblical practice and it should be reserved for people who were diagnosed as suffering from demon possession. The practice of exorcism declined steadily through subsequent centuries but experienced a revival in the late twentieth century. The modern revival of exorcism can be traced to two quite independent sources. First, Christian missionaries throughout the twentieth century encountered cultures in Asia and Africa in which belief in demons remain high. While most missionaries have sought to eradicate the belief through education, others have adopted it and offered exorcism through the delivering power of God as a superior remedy. Some dramatic experiences of people being delivered from demons on the mission field fed a belief in demon possession among a small but growing number of Pentecostal ministers—all open to belief in the reality of demon possession because of their literal reading of the Bible. It is to be noted that across Africa, belief in demon possession and in malevolent magic worked by witches remains operative and occasionally makes the news when people are killed because of such beliefs. Second, in the West, the rise of modern beliefs in demon possession cannot be separated from the cinema. A variety of movies, most notably the 1973 classic film The Exorcist, have presented vivid pictures of demon possession and attempts at exorcism. Although officially presented as fictional accounts, the movies have carried a subtle argument that they were based on real incidents. The results of the modern reintroduction of belief in demon possession and the emergence of modern-day exorcists, both official and unofficial, have led to two phenomena. First, some ministers, usually from one of the many Pentecostal denominations, regularly attempt to exorcize church members and their families whenever dysfunctional behavior manifests. On rare occasions, such exorcisms taken to the extreme result in the death of the person being exorcized either due to neglect of a medical condition or physical harm directed toward the person diagnosed as possessed. Second, Deliverance evangelists have attempted to introduce exorcisms as a regular part of congregational life to church members who do not experience the kind of dysfunctional or psychotic behavior normally associated with demon possession, and who exist in a culture that does not support belief in demons (with many contemporary Christian leaders arguing that Christians are exempt from demon possession). In this context, demonic activity has been reinterpreted as the cause of a variety of negative and disapproved behavior patterns, from anxiety to obesity, in the lives of believers, and ritualized exorcism is offered as the remedy for individuals who seek to change their behavior. The activity of the Deliverance ministries in the last decades of the twentieth century popularized engagement in what is termed “spiritual warfare.” Assuming that Satan and his host of demons are constantly attempting to influence and win control over the lives of individuals, Christians are called upon to be in a constant state of vigilance and actively fight demonic attacks. Leaders in the spiritual warfare movement have also claimed the ability to discern and map the invisible dimensions where Satan, like a military general, strategically plans his attack on humanity. Satan is seen as launching campaigns by targeting specific geographical locations and undermining certain realms of human activity, such as music, recreational activities, and modern education. Cuneo, Michael. American Exorcism: Expelling Demons in the Land of Plenty. Garden City, NY: Doubleday & Company, 2001. Hinn, Benny. War in the Heavenlies. Dallas: Heritage Printers and Publishers, 1984. Macnutt, Francis. Deliverance from Evil Spirits: A Practical Manual. Grand Rapids, MI: Baker, 1995. Wagner, C. Peter, ed. Engaging the Enemy: How to Fight and Defeat Territorial Spirits. Ventura, CA: Regal, 1991. Whyte, H. A. Maxwell. Demons and Deliverance. Springdale, PA: Whitaker House, 1989. Far more frequent than the possession of people is the possession of houses. The entity possessing a building is known as a poltergeist ("rattling ghost"). This differs from a ghost in that a ghost is usually the spirit of a person who once lived and is now dead, while a poltergeist is an entity, force, or buildup of psychic power that has no connection to anyone who was once alive. Anyone can perform an exorcism, and many Witches are called upon to do so. A knowledge of demonology and ceremonial magic can be useful but is not essential. The main thing is that the exorcist be able to speak and act with complete confidence and authority, for the entity must be ordered out of the person or thing it possesses, and it is always reluctant to leave. The Christian Church believes that the subject is possessed either by Satan himself or by one of his minions—a devil. The Church's rites, therefore, command in the name of God, Jesus, or the Holy Scriptures, for example. The fact that these rites are not always effective seems evidence in favor of the pagan point of view that, rather than a "Satanic demon," it is actually a malignant spirit. Since such spirits existed long before Christianity, there is no reason why they should be swayed by the names and terms of Christianity. It is certainly not unusual for a priest to have to make numerous attempts to exorcise before being successful. However, speaking in general terms, there is no reason why one form of exorcism should not be as effective as another. Much depends upon the exorcist and his or her presence and voice of authority. While Christianity considers exorcism a battle for the possessed one's soul, in Hinduism, Buddhism, Islam, Shinto, and many other religions, it is simply a matter of getting rid of an inconvenience and a nuisance. Guiley, Rosemary Ellen: Harper's Encyclopedia of Mystical and Paranormal Experience. HarperSanFrancisco, 1991. Thurston, Rev. Herbert: Ghosts and Poltergeists. Regnery, 1950. From the Greek exousia, meaning “oath,” to exorcise is to ritually expel by means of conjurations and prayers. It is, in effect, a magical ceremony. Ancient civilizations of Babylonia, Assyria and Mesopotamia believed 5,000 years ago that various spirits or entities existed and could possess a person, causing both physical and mental illness. The ancient Egyptians believed in possession and practiced exorcism. The practice is found universally, with exorcism rituals common in many societies. The idea of such possession was especially prominent in the Middle Ages, when the Christian Church was almost totally preoccupied with the Devil and believed all possessions were by demons. Far more frequent than the possession of people is the possession of houses by spirits. The entity possessing a building is known as a poltergeist (“rattling ghost”), which differs from a ghost. A ghost is usually the spirit of a person who once lived and is now dead, while a poltergeist is an entity, force, or buildup of psychic energy, that has no connection to anyone who was once alive. Anyone can perform an exorcism. A knowledge of demonology and ceremonial magic can be very useful but is not essential. The main thing is that the exorcist must be able to speak and act with complete confidence and authority, for the entity must be ordered out of the person or thing it possesses, and is always reluctant to leave. The Church believes that the subject is possessed either by Satan himself or by one of his minions, a devil. The Church’s rites, therefore, command in the name of God, Jesus, the Holy Scriptures, etc. The fact that these rites are not always effective seems evidence in favor of the pagan point of view that, rather than a “Satanic demon,” it is actually a malignant spirit. Because such spirits existed long before Christianity, there is no reason why they should be swayed by the names and terms of Christianity. It is certainly not unusual for a priest to have to make numerous attempts to exorcise before being successful. However, speaking in general terms, there is no reason why one form of exorcism should not be as effective as another. Much depends upon the exorcist him or herself, and whether or not the right presence and voice of authority is presented. While Christianity considers exorcism a battle for the possessed one’s soul, in Hinduism, Buddhism, Islam, Shinto, and many other religions, it is simply a matter of getting rid of an inconvenience and a nuisance. Smith said: "Maybe they would want to go back and exorcise that demon rather than being fearful of returning. Kearney is bracing himself for a "proper cup tie" against the Crues who are eager to exorcise ghosts of their own after losing last year's blue riband final 2-1 to Linfield. BOXING: Antonio Tarver hopes to exorcise the ghosts of his "worst ever day in boxing" by beating England's IBF light-heavyweight world champion Clinton Woods and set up a Bernard Hopkins rematch. The UEFA Cup draw has given First Division Dunfermline the opportunity to exorcise the ghosts of a shock defeat in the same competition. LIVINGSTON keeper Roddy McKenzie will exorcise the demons of last year's CIS Cup semi-final heartbreak by stepping out on the big stage on Tuesday against Dundee in the last four. It was time for her to exorcise those ghosts so she could move on with her life. laid hold of the man and attempted to exorcise his homosexual demons. If anything, Olmsted seems to have haunted the photographers more than the photographs, which can be read as half-conscious attempts to exorcise him. The eight-week, outpatient program combines education to instill healthy sleep habits with counseling sessions that help patients exorcise negative attitudes about sleep. 45pm GLENAVON boss Marty Quinn has told his players to exorcise the memory of Saturday's 2-1 defeat to Linfield when they travel to Solitude this evening. SERGIO GARCIA (left) continues to exorcise one of the most painful golfing demons of his career after another strangely subdued day at Carnoustie. A forces' charity hope to raise thousands of pounds to send ex-soldiers back to the islands in an effort to exorcise their demons.